The Diagnostics Module provides an overview and guide to the FHIR content that addresses ordering and reporting of clinical diagnostics including laboratory testing, imaging and genomics. The diagnostic resources and their relationships are shown below. The arrows represent the direction of the references between resources (for example, DiagnosticReport references ServiceRequest). See the Workflow Module for information about the coordination of activities such as ordering and fulfilling of diagnostics. Implementation Note: See the Genomics Implementation Guidance for additional information about how to use the Diagnostic resources for Clinical Genomic Reporting and Analysis. Observation Vital Signs, Measurement, Results Measurements and simple assertions made about a patient, device or other subject. DiagnosticReport Report, Test, Result, Results, Labs The findings and interpretation of diagnostic tests performed on patients, groups of patients, devices, and locations, and/or specimens derived from these. The report includes clinical context such as requesting and provider information, and some mix of atomic results, images, textual and coded interpretations, and formatted representation of diagnostic reports. ServiceRequest diagnostic request, referral, referral request A record of a request for service such as diagnostic investigations, treatments, or operations to be performed. Media A photo, video, or audio recording acquired or used in healthcare. The actual content may be inline or provided by direct reference. 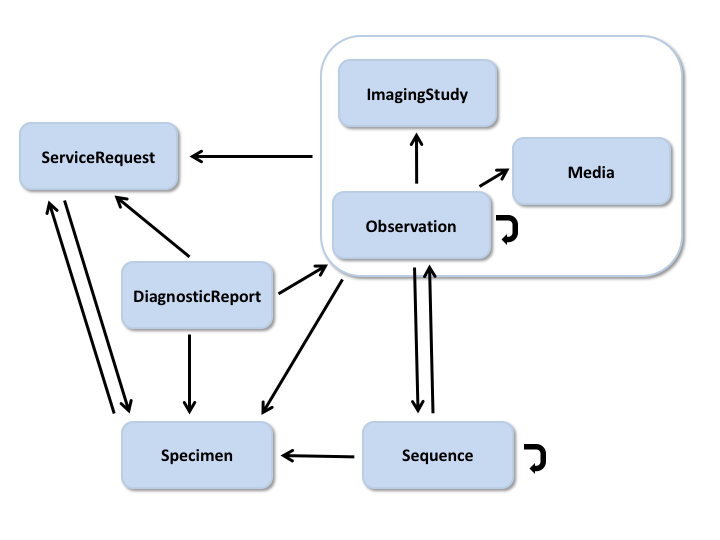 ImagingStudy Representation of the content produced in a DICOM imaging study. A study comprises a set of series, each of which includes a set of Service-Object Pair Instances (SOP Instances - images or other data) acquired or produced in a common context. A series is of only one modality (e.g. X-ray, CT, MR, ultrasound), but a study may have multiple series of different modalities. MolecularSequence Raw data describing a biological sequence. Specimen A sample to be used for analysis. BodyStructure anatomical location Record details about an anatomical structure. This resource may be used when a coded concept does not provide the necessary detail needed for the use case. The diagnostic resources often represent patient-specific data, and as such are susceptible to data breaching. Necessary privacy and security provisions must be in place when searching and fetching this information. For more general considerations, see the Security and Privacy module. Recommending diagnostics such as is done by Clinical Decision Support tools. See the Clinical Reasoning module for more information. There are many ways to use these resources independently as well. The Observation resource, in particular, is central to capturing many measurements and events in healthcare and is often used outside the context of diagnostic orders and reports. recording clinical assessment tool scores such as an Apgar score. The resources that represent the basic information about a patient and a clinical encounter can be found in the Administration Module. Other resources that represent core clinical information generated by healthcare providers during the course of a patient encounter are detailed in the Clinical Summary Module and the Medications Module. The Observation and Diagnostic Report resources have been tested and used in production tooling and as such have reached a maturity level FMM=4 where changes become less likely and require implementer community approval. Future work will focus on developing core profiles and clarifying use cases and boundaries and providing more domain specific examples. We anticipate Observation and Diagnostic Report reaching normative status by the end of this cycle. The ImagingStudy resource has had some limited testing and use. Further use of this resource in production tooling is needed for it to reach a more stable FMM level. The ServiceRequest resources has undergone substantial changes since DSTU2. Foremost of which is the merging of DSTU2 DiagnosticOrder and ServiceRequest into a single resource. In addition, as a result of the addition of FHIR workflow for STU3, its structure and content have been updated to align with the general FHIR workflow "request" pattern. Because of these, it remains a relatively immature resource. No more sweeping changes to its structure are expected. However, its scope and boundaries vis a vis other resources will be the topic of future workgroup efforts. We anticipate its broad use by implementers and that it will mature as a resource throughout the upcoming cycle. The BodyStructure resource is an immature resource with a FMM level of 1. To date there has been little implementation feedback. The Media resource is the newest member to the Diagnostics module having undergone substantial scope and structural changes to create a specialized observation resource focused on digital media such as images and audio files. Future work will focus on developing core profiles and providing more domain specific examples.